A very characteristic part of MSPs are the Onshore Science Parties (OSP) following the offshore drilling phase as the cores are usually not opened/split at sea. The OSP is the real science party, not merely a sampling party. The OSP takes place after the offshore operations are completed. The cores are transferred to the IODP Bremen Core Repository (BCR) located at MARUM, University of Bremen, Germany. The entire invited expedition science party will attend at the OSP and stay for its full duration. The OSP normally takes place within 3-4 months of the end of the offshore operations. The duration of the OSP is in part dependent on the quantity of core collected. 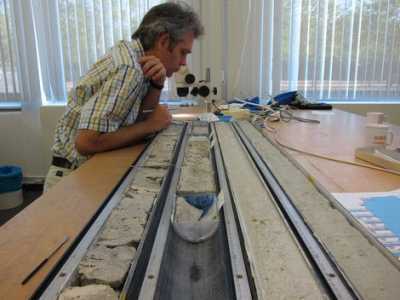 At the OSP, cores are split and scientists have their first opportunity to study the samples in more detail, as they have access to the full laboratory facilities of the BCR. Please indicate your equipment and consumables needs for the OSP already in your sample request, especially if it is not standard equipment/procedure already listed in the core flow. All expedition scientists stay at the OSP in Bremen until all measurements, reporting, and sampling has been completed. The end of the OSP is the equivalent of coming off one of the bigger IODP drillships. for IODP Exp. 310 (Tahiti Sea Level) ECORD Newsletter #7 (p. 3-4). for IODP Exp. 313 (New Jersey Shallow Shelf) ECORD Newsletter #14 (p. 3-7). for IODP Exp. 325 (Great Barrier Reef Environmental Changes) ECORD Newletter #15 (p. 6-7).